A turbo diesel 2 litre engine was started and left idling for 30 minutes in the garage, with the doors closed, after which the doors were left open for four hours. The car was fuelled with low sulphur fuel. Three filter cigarettes were then lit up sequentially, and left smouldering for a further 30 minutes. The nicotine and tar content of each cigarette was 1 mg and 11.2 mg, respectively. A portable analyser took readings every two minutes during the experiments. Combined particulate levels in the first hour after the engine had been started measured 88 ug/m3. Those recorded in the first hour after the cigarettes had been lit measured 830 ug/m3: 10 times greater. These findings have already been discredited...by common sense. We can see that, many emissions more or less insignificant, form the 53% that is globally greater than road traffic. 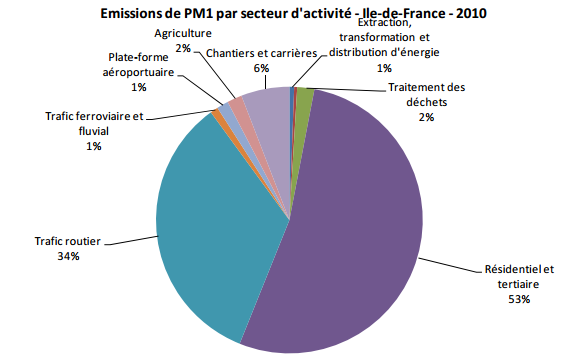 Particulate emissions in Ile-de-France for the year 2010 related to smoking are estimated at 110 tons. These particles emitted from cigarette smoke are considered to be PM2.5. For comparison, emissions from road traffic P2.5 for the same year is 3900 tonnes. Particulate emissions related to tobacco consumption therefore represent almost 3% of regional emissions of PM2.5 *, the average share may be higher locally. *: the person forgot "from road traffic"
We have no specific document mentioning this figure. You can quote as a personal communication Airparif. 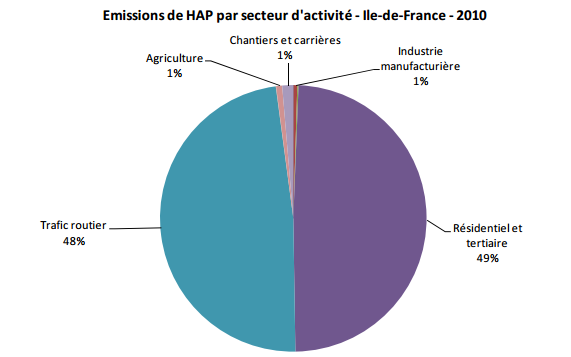 In a country like France, 35% of people smoke, and where we can roughly estimate they would smoke 10% of their car ride, then the contribution in traffic jams of tobacco in combustion could be 10 /3 (3 cigs were used) * .35 * .1 = 12% of cars exhausts. So how would you interpret these figures? Are there enough information or not, since tobacco smoke contribution in PM1.0 and less isn't measured? What could be the exact proportion of the contribution of tobacco smoke in the air of midly smoking city (30% of the population)? Browse other questions tagged environmental-health smoking pollution . Does your body suffer one mutation for every 15 cigarettes you smoke? Are E-Cigarettes as unhealthy as conventional cigarettes? Does the DuPont/Denka plant in Lousiana emit 250,000 pounds of chloroprene annually? Does a cruise ship emit as much particulate per day as one million cars do?